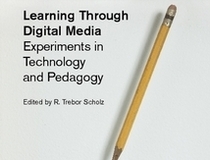 Michael Preston and I have co-authored a chapter— Teaching and Learning with Video Annotations —for the recently released anthology, Learning Through Digital Media: Experiments in Technology and Pedagogy. This chapter recapitulates the history of multimedia annotation projects at CCNMTL, focusing especially on the pedagogies and learning outcomes that have motivated much of my work at CCNMTL work over the years. We discuss curricular activities which have stimulated the development of our VITAL and MediaThread multimedia analysis environments. Trebor throws a great conference. Mobility Shifts is part of a bi-annual conference series on Digital Politics. The conference topic ’09 was digital labor, and in ’13 it will be about digital activism. Trebor is truly a performance artist when it comes to organizing conferences. He works really hard to get people talking to each other before the conference starts, so that when people arrive they are already in the middle of a conversation. For the Internet as Playground and Factory he produced a series of short videos introducing participants to each other (mine is here). This year he published a peer-reviewed anthology, available in a variety of formats, including hardcopy, PDF, ebook, and web-based. Learning Through Digital Media was published in March 2011 by the Institute of Distributed Creativity under a creative-commons license (CC-BY). Using the Gentle Calm theme designed by Phu Ly. WordPress took 0.482 seconds to generate this XHTML page.